The Fahaka Puffer has yellow stripes and bright fiery eyes, making it a beautiful pet fish! The Fahaka Puffer Tetraodon lineatus is a large puffer fish with a robust comical appearance. Although its color pattern can be quite variable, this puffer can be very striking. Juveniles are often rather mottled in appearance, but as they mature an overlay of golden bands develop and darker areas become a deep red. LIke all puffer fish, the Fahaka also has the ability to change color depending on its mood. Some common names describing this handsome fish, based on its overall appearance, include the Lined Freshwater Puffer, Striped Puffer, and Band Puffer. It's a freshwater puffer fish originating from the Nile River, so is also known as the Nile Puffer. And of course being a puffer it can inflate into a ball, so the Fahaka Puffer is further called a Globe Fish. The Fahaka Puffer has an intelligent and curious nature and can become a very friendly pet, but can also be incredibly aggressive toward tank mates. They will most likely damage or kill any other fish that is kept with them. All puffers have a sharp beak in their mouths and the Fahaka Puffer will use it to remove pieces from just about any living thing that is in the tank with them. They are a type of carnivore called a molluscivore, meaning they eat all sorts of benthic organisms like oysters, mussels, scallops, clams, and krill. In the aquarium they will love to chase fiddler crabs, gut-loaded ghost shrimp, and crayfish. If you want a wonderful single specimen aquarium, don't let the aggressive nature of the Fahaka Puffer dissuade you from keeping one. If kept by themselves, they can really be a wonderful pet and can be easily trained to take food from your hand. This Nile Puffer fish does grow quite large, reaching up to about 18 inches (45 cm). So it will require a tank with enough room to accommodate its size, 100 gallons or more for a single specimen. 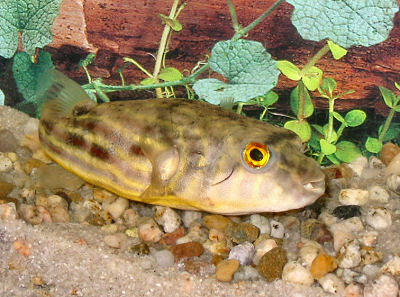 The Fahaka Puffer Tetraodon lineatus was described by C. Linnaeus in 1758. They are found in the Nile, Chad basin, Niger, Volta, Gambia, Geba and Senegal Rivers in Africa. They inhabit large rivers and open water, as well as weed beds and vegetated areas. Other Common names it is known by are Striped Puffer, Nile Puffer, Band Puffer, Lineatus puffer, and Globe Fish. Several sub-species of the Nile Puffer Tetraodon lineatus have been described. One sub-species called Tetraodon fahaka rudolfianus was described by Deraniyagala in 1948. It would be well-suited for the aquarium as it only grows to around 3 inches. In the wild the Nile Puffer is considered a molluscivore. It mainly consumes benthic organisms like oysters, cockles, krill, and mussels. In its natural habitat these Nile Puffers usually breed at a water depth of 50 feet. This makes it difficult to breed in captivity, but breeding has been successfully documented. The Fahaka Puffer is a stocky elongated fish covered with short prickles and has bright orange/red eyes. Its body is brownish-gray on the back, gradually becoming lighter towards the under parts, ending with a whitish belly. There are a series of light, often golden colored, horizontal stripes running from the pectoral fins back across the tail. Hence its common name of "Band Puffer". Like many of the puffer fish, the coloring of the Fahaka Puffer fish can vary with age, disposition, and environment. While a juvenile may have a more mottled appearance, the adult will become more intensified, with the dark areas taking on a deep red coloring. These puffer are known to change color depending on mood. Puffer fish have the ability to 'puff' themselves up with water or air if threatened. When they inflate, their spines protrude outward and this apparently helps keep them from being eaten. Another defense of many puffer species, including this one, is to produce toxic substances in their flesh that is poisonous if eaten. These are very large puffers and have been known to grow up to 18 inches (45 cm). Puffer fish can be quite long lived in the aquarium, many living for 10 or more years. A sub-species called Tetraodon fahaka rudolfianus would be well-suited for the aquarium as it only grows to around 3 inches. Size of fish - inches: 18.0 inches (45.72 cm) - Can reach at least 18" (45 cm) in length, and possibly larger. The Nile Puffer is not a very difficult fish to keep if you are able to meet all their requirements. They are extremely aggressive fish so are not normally able to keep others in the same tank. Their space requirement for a mature puffer is around 125 gallons. They require big powerful filters the will turn the tank over 6 to 10 times an hour and weekly water changes. The food costs for these big fish can be pricey as their need for human quality seafood is necessary. If you are up for all of that; this Striped Puffer will make an entertaining and almost human like expressive pet! The Fahaka Puffer or Globe Fish are a type of carnivore known as a molluscivore. Their natural diet consists of insects, mollusks, and crustaceans; so snails, crabs, crayfish and shrimp would be good choices as food. In an aquarium they will also eat small fish and can sometimes be trained to eat freeze dried krill. This puffer should be fed every other day while small, decreasing this to just two or three times per week as an adult. Puffers have strong teeth that grow throughout their lives. They need to be offered hard shelled live food often to keep their teeth worn down. Acceptable foods include shellfish, crustaceans and hard shelled foods such as snails will help wear down the teeth. If the teeth get too long, they will be unable to eat, requiring the owner to clip the teeth. Feeding requirements will change as these puffers age and grow. If you start off with a young small Nile Puffer a diet of snails, krill, and frozen foods will work. Once your puffer reaches 6 plus inches the grocery store or fish market will now be the source of their foods. A diet should include shrimp, lobster and crab legs, mussels and clams can also can some presoaked jumbo krill. As with any predatory fish the thought of feeding feeder fish seems like a good idea. Do not do this, feeder fish can introduce disease to your tank. Live foods (fishes, shrimps, worms): Some of Diet - Be careful with feeder fish as they can pass disease when introduced to your tank. 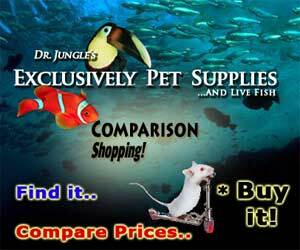 Meaty Food: All of Diet - For a young small puffer a diet of snails, krill, and frozen foods will work. Once your puffer reaches 6 plus inches Offer shrimp, lobster and crab legs, mussels and clams, and presoaked jumbo krill found at the grocery store or fish market. Fahaka Puffers are not particularly fast growing so smaller specimens can be kept for some time in a relatively small tank. Eventually you'll need a minimum 125+ gallons to give your pet the best environment. Since puffers do not have gill covers or scales, they are thought to be more susceptible to diseases, nitrite, nitrate and ammonia levels. Consequently they are not a good fish to cycle an aquarium with. Also because they usually don't eat all of their food (messy eaters! ), these fish will usually put more load on the aquarium filtration requiring more frequent water changes and better maintenance in general. A generous weekly water change of 30% to 50% is the standard recommendation for a puffer aquarium. A canister filter that will turn the tank over 6-10 times per hour is recommended. Water Changes: Weekly - Water change should be 30 - 50% weekly. The adult Fahaka Puffer needs a lot of space, and a tank at least 125 gallons in recommended. These puffers need to be able to completely turn around in the tank unobstructed. A sand substrate is the best choice for these puffers. There is no need to add any salt to their tanks but will tolerate low amounts. If you want to decorate the tank use smooth rocks and drift wood for your decor. Plants can be added but the puffer will likely chew them up during feeding. Tetraodon lineatus are sensitive to nitrites and ammonia and should only be introduced into a fully cycled aquariums. Furthermore these puffers are messy eaters and produce a lot of waste, requiring large canister filters that can turn the tank over 6-10 times per hour. This puffer fish is predominantly a freshwater species, though it can be kept in lightly brackish conditions. Provide water parameters of Temp: 75° - 82° F (24 - 29°C), pH of around 7.0, and Hardness: 10 -12 dH. Never put this puffer in soft water. Brackish: Sometimes - Although it is a freshwater fish, it can be kept in lightly brackish conditions. The Fahaka Puffer is extremely aggressive and intolerant of other fish and should be housed alone. They have been successfully housed in very large tanks with fast moving fish that they can not catch. It can only be kept with its own species in a tank that is large enough that they each have their own area and rarely cross paths. Expect fights every time they see each other. However the Fahaka Puffers make very friendly, personable pets. They will bond with their owners and seem to almost communicate with their unique facial expressions. Venomous: Yes - The Fahaka Puffer can be venomous if it is consumed as puffer fish are known to harbor toxic substances in their flesh. Same species - conspecifics: Sometimes - Only if the aquarium is extremely large, providing each with its own area and their paths seldom cross. They will fish if they see each other. Semi-Aggressive (): Threat - Only fast moving fish that it cannot catch can be kept with this puffer fish. Shrimps, Crabs, Snails: Threat - is aggressive - These puffer fish feed on benthic organisms. Sexual differences are unknown though females may be distinguished when spawning as their bellies get rounder while males will remain more slender. The Fahaka Puffer has not been bred commercially in captivity, but there are reports of successful breeding by hobbyists. The difficulty with breeding these fish is that they will normally kill each other on sight and when they do breed it is normally at 50 feet or deeper in nature. The Tetraodon lineatus breeds when the female produces an ovipositor organ and will mate with any male that is willing. The male puffer will swim upside down under the female and will grip the female so that both sexual organs connect and eggs and sperm are released several times, fertilizing thousands of eggs. Once the eggs sink remove the eggs to a separate tank. The eggs will hatch in 3 to 4 days, at this time the water level will have to be lower so the young fish can have access to the surface. After a week you will see the babies starting to swim freely and need to be fed infusoria. These babies need constant feeding to prevent starvation. Into their 2nd week they will start to take brine shrimp. Like their parents they grow very fast and become aggressive, so it is wise to segregate the larger more aggressive ones. The Fahaka Puffer does not have gill covers or scales which make it more prone to disease. Puffers are normally the first fish in a tank to show signs of ick and will twitch and rub around the tank. They respond well to most medication and normally heal quickly. NEVER use copper in an Fahaka Puffer tank. Nile Puffers are wild caught and can carry internal parasites, a de-worming should be done if it hasn't been done yet. Heterobothrium Infection is also common, it is an infection of the gills. A Formaldehyde bath can help cure this. For more information about freshwater fish diseases and illnesses, see Aquarium Fish Diseases and Treatments. The Fahaka Puffer or Globe Fish are commonly available, but due to their aggressive nature you may have a hard time finding them in most retail store. I just purchased my fahaka puffer, was told he is very agressive and grows 5'' but if raised with other baby fish it may do fine with all of them growing together! I have a 125 gallon tank includding my globe puffer, 2 peacock cichlids, tire track eel, 2 african cichlids, 3 tiger barbs, electric blue jack dempsey, 2 feather fin catfish, jeweled cichlid, 1' plecostomus, blood red parrot, they all get along beautifully! No problems at all! We will be upgradeing to a tank twice the size eventually ;) p.s researched when I got home to realize he grows 18''. Adriane, just get a separate tank for your puffer. As he gets bigger it's very likely your other fish will randomly become victims of nasty bites or viscous predatory attacks. I love my fahakas but only put fish with them that I would be ok with losing. Yeah, this is what's going on with me! 75 gallon tank. 25 African cichlids Fahaka Puffer, 2 clown loach. Noticed fins being nipped never seen it happen. Must be the puffer. He is at 3 inches. Been feeding clam, mice shrimp. Trying to figure out what size tank I should get and what filter. For the long run. Yeah,,, I just got 3 tiny little FP.... learning a lot.... but they all 3 stalk together! I have 2 baby Oscars the slightly larger than them as well as 4 cichlids same size, the 3 will soooo slowly stalk one fish at the same time,, and the crazy part is, if they see me, they will hide around the corner of decorations and wait for me to leave to begin their hunt again... all this behavior in one day! Anyway, I have a 75 gal to transfer to in the next few days temporarily and will choose my favorite and give or sell the rest so there is no issue. Then as they grow will definitely go tank shopping haha! Such characters these little fellas are! In nature these fish will inhabit both freshwater and brackish waters of the river systems, but they tend to do best in freshwater in the home aquarium. There is no need to add salt, and if you do, keep it to a minimum. See the 'Aquarium Setup' section above for more info on their tank requirements. fahaka puffers are not saltwater fish, DO NOT switch it to brackish, this would only shorten the lifespan of the fish. Are there tank mates for the fahaka when it's fully grown? No, probably not. They are intolerant of other fish. See the Social Behavior section above. I think you can get away with african cichlids depending on your tank size. I have a 7 in fahaka puffer that I have had in a 240 gal tank with about 45 african cichlids. I got him when he was about an inch and no problems yet. My puffer hasn't ever eaten a fish that was not about to die or already dead. The cichlids are breeding all the time and the puffer just ignores them. The only problem I have is when it is time to feed I have to wait until the cichlids are sleep because they are way faster then the puffer and will steal his food and it cost way too much to feed cichlids live food.